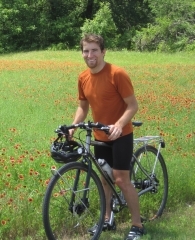 While on a long-distance hiking or biking trip, many people choose to keep a journal. Some people intend to later write a book, some people may be trying to draw attention to a fundraiser, others may want to keep friends and family in the loop, and still others may be doing it only for their own eyes. Whatever the reason, journaling can be a fulfilling addition to the experience. Writing in your journal every day allows you to recall some of the small details you might’ve forgotten by tomorrow. Summarizing what’s already occurred may give you a better perspective on the adventure as a whole, which can go a long way towards fighting mental fatigue and burnout. And, of course, keeping a journal allows you to revisit the experience years or even decades later. It wasn’t long ago that keeping a journal meant carrying a physical journal. While there are more high-tech solutions available, there’s something to be said for putting pen to paper. A lot of people choose to go hiking/biking in order to “unplug” and keep their screens put away as much as possible. Paper journals also have the advantage of unlimited battery life. Unfortunately, paper journals can’t get wet, but the same can be said for almost any other means of keeping a journal. For the more artistically inclined, paper journals can do double-duty as a sketchbook, or even a scrapbook! It's also a lot easier to jot down notes in different formats, like a list or a timeline. And finally, there's something about being able to pick up your notebook, the same one you carried with you on the trail, that brings back memories much better than staring at a text document on a screen. In the interest of saving weight, many hikers and bikers now choose to keep a journal on their smartphone. This is an elegant solution; you were probably going to bring a smartphone anyway, why not make use of it? For most people, typing with your thumbs is marginally faster than writing on paper, which means keeping your journal up-to-date won’t take us as much of your time. As speech-to-text technology continues to improve, even more time can be saved. It’s even possible to dictate journal entries while hiking/biking, then use only a small amount of free time to edit for autocorrect mistakes. The most obvious downside to keeping a journal on an electronic device is the battery drain. It can be difficult to keep electronic devices charged while in the bush, and using a device for an additional daily purpose, especially one where the screen is always on, will only make this problem worse. In order to save battery, try turning the screen’s brightness all the way down, use an app with a dark color scheme, or if possible, change the color scheme within your app of choice. Whether you're keeping your journal on paper or in an electronic device, many people like to publish their journals online. Doing so generally boils down to three choices: create your own website, post on social media, or use one of many free blog sites. Of course, there's no reason you can't do two of these, or even all three! As far as which blog site to pick, there are almost too many options to count. Some are specifically made for hikers and bikers, and a few platforms manage to combine some social media elements with a simple online journal. If you're interested in connecting to other hikers and bikers and reading their journals, you might give one of these sites a try. Write your journals in an app that allows you to save them offline, then copy-paste/upload them later. Wait until you have a connection, then write your journals all at once. 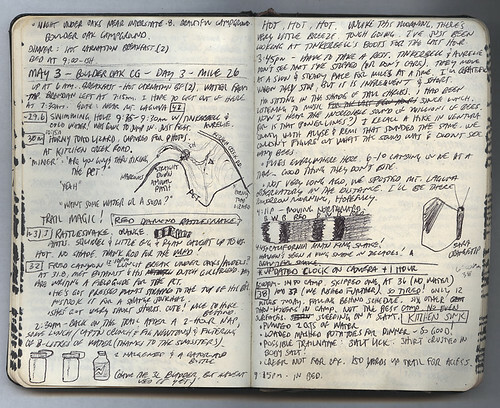 Write in a paper journal most of the time, then re-type them later. Option #1 works best for most people, except for those who prefer to avoid using electronics as much as possible. Option #2 has the downside of frequently causing you to get days or possibly weeks behind in your journals. By the time you finally get a chance to catch up, you may have forgotten quite a bit, or you simply might not feel like it anymore. This also requires you to write your journals in marathon sessions, which few people would want to do mid-adventure. When you take the luxury of a zero day, you want to enjoy it, not spend half the day on something you “have” to do. Option #3 works, but requires you to write all your journals twice. This might be OK if you wanted to keep electronics use to a minimum and you don’t mind re-typing all your journals after it’s over. Speaking from experience, it’s difficult to motivate yourself to work on your journals after it’s over. Of course, not all journals are composed of the written word. A few hikers/bikers prefer to keep a voice recording of their adventure (there’s an app for that), and now that carrying a video camera is incredibly easy (smartphones again! ), keeping a video journal is an increasingly common and attractive option. Once again, a chief downside is battery drain, and with video, storage comes into the mix. Recording video uses both a lot of battery and a lot of hard drive space. Those who plan to keep an extensive video journal will likely need to bring extra storage, though SD cards are awfully lightweight and small. While taking a video is about as easy as pushing a button, turning your raw footage into something watchable will take many hours of “post-production”, likely after the adventure is over (some folks manage to do this mid-adventure!). This may not be an ordeal if you were only planning on making a five-minute highlight video, but if video is your primary means of documenting the voyage, make sure editing video is something you already enjoy before putting all your eggs in that basket. In addition to simply using a smartphone, there are lots of options for taking video, and which one you choose depends on how you view the tradeoff between video quality and the need to carry more stuff. Some cameras are specifically dedicated to filming outdoor adventures and can be mounted to a pack, handlebar, bike helmet, or almost anything imagineable, leaving your hands free for hiking/biking. Nowadays, some people even use a drone to film themselves! All this and we haven’t even talked about photography. We’ll save that for another article, along with a more detailed discussion of videography.